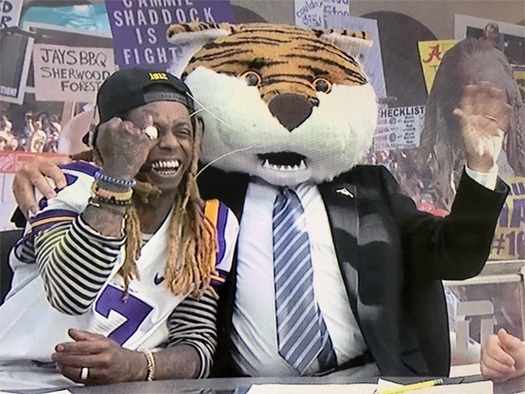 This past weekend on November 5th, Lil Wayne made an appearance on ESPN’s “College GameDay” show that was filmed at the Tiger Stadium in Baton Rouge, Louisiana while rocking a LSU Tigers jersey. While on the pre-game show, Tunechi made his picks for 10 games along with the “College GameDay” hosts Desmond Howard, Lee Corso (who jokingly stole Tune‘s diamond pinky ring), and Kirk Herbstreit. You can check out Weezy‘s full appearance on “College GameDay” after the jump below!